What do students learn in DP? Students learn more than a collection of facts. Learn to ask challenging questions. 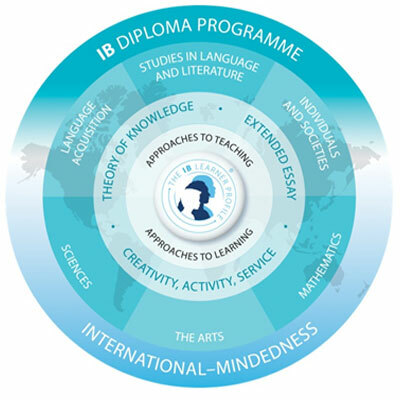 The IBDP follows an inquiry- based curriculum which contains six subject groups together with a core consisting of TOK, EE and CAS. Theory of knowledge (TOK) challenges students to question the base of knowledge – to reflect critically on how they know what they believe to be facts or truth. TOK is a course about critical thinking and inquiring into the process of knowing, rather than about learning specific body of knowledge. TOK course examines how we know what we claim to know. It does this by encouraging students to analyse knowledge claims and explore knowledge questions. TOK is assessed through an oral presentation and a 1,600 words essay.. TOK encourages students to become thinkers, inquirers, reflectors and open minded individuals appreciating global diversity. The extended essay is an independently created research- essay consisting of 4,000 words, which is mandatory for all students. The extended essay provides students with an opportunity to explore a topic of their preference. It helps students develop their research, communication, analytical and evaluative skills. Each student has a mentor, a school teacher, to guide him/her throughout the whole process of researching and writing the extended essay. This process concludes with an interview with their supervisor. CAS is a mandatory core component of the IBDP. It provides a counterbalance to the academics of the programme. CAS enables students to enhance their personal and interpersonal engagement by learning through experience and also provides opportunity for collaboration. Creativity – arts and activities that involve creativity. Service – voluntary work that promotes learning. CAS encourages students to undertake new challenges, initiate activities, work collaboratively in a group, show perseverance and commitment towards a goal, engage with issues of global importance, consider ethical implication and develop new skills. Which subjects do we offer? Standard Level (SL): Teaching time of 150 hours. Higher Level (HL): Teaching time of 240 hours. Under the guidance of the subject teachers at school, students complete their internal assessment components, which is marked at school and sent to IB for moderation. On the completion of the programme, students appear for IB DP Examination in the month of May which is conducted by IB and all scripts are sent to IB for marking.